Will you submit to the Groundswell Awards? Left Image: Josh Bernoff, on his Keynote Presentation at Forrester’s Consumer Forum 07, demonstrates a “Judo throw” –a metaphor of deflecting negative brand attacks into momentum for your energy, although they sustained a few bruised ribs, I often think of Dell (previous Groundswell Award winner) as a good example. Forrester is recognizing excellence from companies that are accomplishing business objectives using social applications and technologies. We want to hear how you’ve used the many tools out there to actually make a difference with your customers, prospects, or maybe employees. Colleague Josh Bernoff has more details on the blog, if you’ve worked with me, you know I’m interested in seeing actual business results –show how you’ve moved the needle. So, if you work for an agency, brand, or maybe are with a boutique, get your case study together and submit. I’m looking forward to reviewing all the great work folks have done. I look forward to recognizing your great work, on a related note, check out my posts tagged case study or read my reports to see what I think is effective. Also, Josh’s “assailant” seen tumbling through the air is a martial arts expert, and coincidently the editor of my last report, thankfully Harley Manning is alive and well. A rather sad paradox, where fear has overtaken an opportunity to improve relationships with patients and clients. While this may not hold true for every pharmaceutical company, I recently met one who had banned it’s employees from monitoring blogs, social media and the online conversation. Responding to every customer can be very, very costly, considering how many people may be talking about medicines, often anonymously in online forums. We saw similar fear a few years ago as Finance and Insurance companies were afraid to toe-dip into the conversation due to strict government regulations, although were seeing companies like Wells Fargo launch blogs and virtual worlds, aimed at the ‘lifestyle’ discussion, rather than specifics on your checking account, or CD. Despite this troubling limitations set on the pharma industry has resulted in low adoption, at least two brands have joined the conversation, Johnson and Johnson’s ‘Connect‘, an interactive media site, and Glaxo Smith Klein’s ‘Alliconnect‘ Blog according to Mark Senard. While it’s easy to outline the risks, let’s quickly talk about the opportunities: Pharma companies can improve their customer insight from an ongoing focus group, reduce time to market for new drugs by understanding risks faster and more quickly, and have a stronger connection to customers, making marketing more efficient. If you know of any pharma companies that have turned a blind eye, or have embraced the conversation, please leave a comment below. Update: I added “Some” pharma companies as the new title in the post. A new form of the Groundswell has appeared. What’s the Groundswell? We define it as a movement where individuals get what they need from each other, rather from existing institutions. The following hits home so hard for me, as I cover Social Computing as an Analyst, and I’m a former enterprise intranet manager. This site launched today, although a few of my colleagues were briefed last week. Essentially, to obtain knowledge about company reviews, CEO reviews, and salary information, you have to first submit your information –all anonymously. This stealth startup, which just launched is being discussed on Techcrunch and on Cnet. I just reviewed my former employer to gain access. Essentially, companies are peer reviewed, and you can find out industry averages to see how well you do or don’t measure up to industry peers. I covered this company a few weeks ago when they launched, essentially a public version of SalesForce’s IdeaExchange, it lets companies innovate (embrace) with customers by letting them submit –then vote– for the features, services, and products they want. Although mainly satisfying startups with limited resources, and the occasional Comcast, this startup provides customers a universal way to support products, on one site, rather than visiting hundreds. A few savvy companies have started to monitor their brand. Although currently shut down, it was very active in 2001-2003, this site tracked the many miserable failures of dot coms, and even Enron. Many internal memos were published within hours on this site. Of course, it goes without mention that many colleagues are assembling on these social networks, before, during, and afterwork. Some frustrated companies block social networks from their firewalls, while the next generation of workers will simply bypass those shallow walls using mobile devices –the Groundswell is difficult to stop. Instead, brands should lead with policy, embrace, and look for the business opportunities of having a connected workforce. The previous examples indicate a trend of what’s happening: The conversations that used to take place at the physical watercooler, has now shifted online, organized, and manifests as something greater. But what are the impacts? Sometimes false, sometimes inflammatory, and sometimes truthful, yet frustrated sounding information will be posted to these sites from employees, former employees, and customers. Employees get more control, as their voice will be heard to other colleagues, and in some cases, to the entire internet. Salaries will be puffed, as professionals will seek to demonstrate how much they are valued, I expect salary data to be inaccurate, and inflated. Candidates will have more bargaining power during hiring process, as they can view not only third party salary.com, but now look at pan-industry salaries –hiring managers and recruiters will refute. Corporations will flinch, and many will setup policies to prevent employees from posting private information outside of the firewall although many of these internal memos will appear within hours on the very sites they seek to stop. Dissatisfied and passionate customers will assemble on these third party sites to self-support each other, few companies will realize how they need to follow the conversation. Some savvy brands will get ahead of this Groundswell, and launch their own tools internally and externally, some will successful centralize –then lead –their market conversation. What other impacts do you see happening from this new pattern of websites that turn power over to employees and customers? Every once in a while, I spur on an interactive game on Twitter. A few weeks ago, I held a Jeapardy game, and one lucky winner received a Groundswell book. A flurry of answers came in from many twitter users, there were at least a 100 answers, you can view them all on this Summize page, of all tweets tagged #brands. Did you know that Hidden Valley ranch is owned by Clorox? Lamborghini owned by VW, Ben and Jerry’s owned by Unilever, Purina owned by Nestle, Dasani owned by Coke, and Tiffany & Co Watches owned by Swatch? I didn’t announce there was going to be a winner, but I’m rewarding @kellieparker (a community manager for PC World) for her several updates, and helpful tips. Charlene dropped off a stack of signed books at my desk, and I can do whatever I want with them. I’m going to use them to send to the community pioneers, those that participate, have fun, and help others. Kellie, send me your address, and I’ll send it on over. I’ll be playing others games here on my blog, twitter, or friendfeed, see you there. Just finished reading the official Groundwell book poolside in the warm CA sun. I’ve actually read the book, but before it was even close to print, that version was slightly different and incomplete than the one on bookshelves today. Before I started at Forrester, Charlene suggested I be one on the advance readers, she stopped by, handed me a spiral bound print out, and asked me to read it and provide my input. I read the book during my trip to Hong Kong, and marked the book up, some of my suggestions I hope were helpful, I do know that one of my examples made the book. The example about Scoble’s wiki not working well was my submission. If you’ve read the book, you’ll realize it’s based on a solid methodology, case examples, and cites data from Technographics, this is a practical version of previous social media books. Which books in particular? Cluetrain, then Naked Conversations are really desktop references and preludes to this book, I recommend all of three of these. This Thursday, I’ll be speaking at the 10 year anniversary of the Cluetrain event, Doc Searls to give the keynote at SAP in Palo Alto, hope to see you there. I was with Shel and Robert at their book launch party for Naked, and then started to learn under Shel, he taught me a great deal. Now, I’m working with the Groundswell authors, it’s an amazing adventure. I’m somewhat biased being a Forrester employee and working with the Groundswell colleagues, but I’ll tell you what it’s missing: tactics. This book is a strategic framework, a real methodology that tells you the right way to approach social media. It doesn’t give you specifics on technologies, and how to use them, which of course would make the book have a very limited shelf life, so the tactics will be found on blogs, twitter, podcasts, that you, and you, and you, will write. I’d love to hear your thoughts on the Groundswell book, what did you like and dislike? Will you apply the POST methodology at your workplace? What did your boss say? Related note: If you have one of my latest business cards, turn it over for a mesmerizing effect. 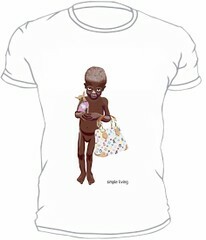 Left Image: An impoverished Darfur child is shown holding an LV-like purse, image sold as a T-shirt from artist, now being sued, see Hi-Res version. Thanks to Søren Storm Hansen for bringing this to my attention. It could have been Rolex, Lexus, Gucci, or even your brand, sadly for LV, it was theirs. A 26 year old artist named Nadia Plesner has been sued by Louis Vuitton for brand jacking their famous purses in a anti-genocide campaign. The artist was trying to make a point that the media cares more for Paris Hilton extravaganza’s more than the genocide in the nation of Darfur. “My illustration Simple Living is an idea inspired by the medias constant cover of completely meaningless things. My thought was: Since doing nothing but wearing designerbags and small ugly dogs appearantly is enough to get you on a magasine cover, maybe it is worth a try for people who actually deserves and needs attention. When we’re presented with the same images in the media over and over again, we might start to believe that they’re important. As I was reading the book ”Not on our watch” by Don Cheadle and John Prendergast this summer, I felt horrified by the fact that even with the genocide and other ongoing atrocities in Darfur, Paris Hilton was the one getting all the attention. Is it possible that show business have outruled common sense? Luxury brands certainly have teams of brand police within Marketing to ensure their products aren’t being misplaced or improperly positioned, and have taken action by first sending a cease and desist letter (notice they “applaud the efforts) PDF. Nadia then sent a return note, stating this was her ability to self-express and claimed the logo was not referring to LV in particular (PDF). The letter was not met well, and LV has now filled suit against Nadia, claiming damages of over $20,000 a day, each day the campaign is continued. Since then the Darfur has grown in awareness, having now been on Digg, a Facebook group formed, spread in the news, and hundreds of blogs pointing to her site. Here’s my take, from what I can tell, Louis Vuitton (and the dog) have nothing to do with Darfur, and their brand is being dragged through the African mud. Their response is pretty standard and expected, to protect the image and brand that they’ve been working to build. I’m sympathetic to them getting brand jacked, as they’ve not done anything to occur this unwanted attention. Option 1: Continue legal path: Continue this path and settle with Nadia, given the many lawyers they have access to and resources, they will likely win a copyright infringement for the design being on another paid product. Option 2: Join the campaign: They could drop the suit, and work with the Save Dafur organization to help raise funds by doing events, creating a specific product, or help promote the cause. This too has it’s downsides, the brand will be brought into the human rights spotlight, and if they have any dirt in this arena (perhaps oversees manufacturing) they’ll be in turn scrutinized. Secondly, this would be a nod to activitists everywhere to brand jack major brands in order to get support –and funding, the cycle will continue. I’m weighing both options here for LV, there’s really not a great way out of it for them. I believe they are collateral damage, having done no wrong to invoke this groundswell, yet this is a nod to what could easily happen to other brands. ronbailey: – why not just donate a few bucks to the cause in exchange for her NOT using LV products in her campaign? Kim Pearson: I’m a former PR person, not a lawyer, but I’d argue that LV is doing itself more harm by its response, not protecting its brand. Rainne: I say not, b/c the artist did not use the vuitton pattern, she simply invoked its similarity. ronbailey: They could have easily turned a blind eye to the whole episode. Ok, you weigh in, If you were the CMO, what should LV do?